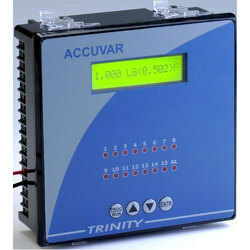 Our product range also comprises of Automation Controller, Vibration Monitoring System and Measuring Transmitters. The control parameter is VAR, and not PF. Target PF value is just used to calculate the capacitive VAR required to be added/removed to achieve the desired PF. e.g. If the target PF is unity, means that the target VAR in the system is zero. If system KVAR is 200 lagging, then the controller needs to add 200 KVAR of capacitor banks to reach zero VAR. The calculation of the reactive power in the system is done by taking instantaneous samples of all voltage and current waveforms, in all four quadrants. These values are then subjected to DSP techniques to add a frequency independent 90° phase shift to current samples. The product of these voltage and current samples then generate signed VAR value. 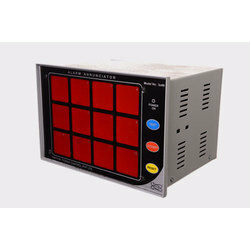 VAR controller then takes into calculation the prevailing system KVAR, the prevailing bank KVAR and the bank sizes of each stage, and then switches ON/OFF the combination which is closest to the needed VAR. By keeping track with the latest fashion trends, we are bringing forward an attractive range of Automated Alarm System. Supply Voltage : 90-270 VAC/DC or 20-60 VDC. Operation Sequence: Multiple sequence option with site selection facility. Push Button Controls: On board Test, Silence(optional),Accept, Reset buttons. No. of windows: 24 Window (4R x 6C). Window size: 30 x 30 mm. No of LED`s per Window: Super bright 4 LED`s in Parallel. Power Consumption: 0.8 VA per window. Terminals: Suitable for 0.2 to 2.5 sq. Mm. Cable. Scan time: Less than 10 ms. Response Time: Less than 10 ms. Fault Input Contacts: Potential free contact needed. (LIVE Input Fault Contact can be Optional ). Output Connection: Remote TEST, SILENT, ACCEPT,RESET. Enclosure: M.S. Enclosure with high strength. Output Contact Rating: 7 amps at 230 VAC Resistive. Noise Immunity: 2KV as per IEC 61000-4-12. Impulse Tests: 5KV as per IEC 60255 -5. Environmental Tests: As per IS 9000. Max. 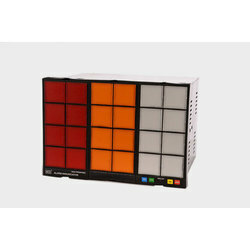 Ambient Temp: 0-60 Deg C.
Window Colour: Red, Yellow, Green, Blue, Amber & white. Cutout size: 208(W) x 138(H) mm. Over all Size: 216(W) x 144(H) x 160(D) mm. 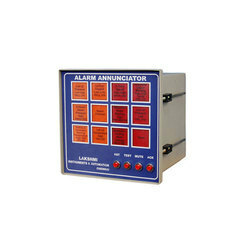 Looking for Alarm Annunciation System ?